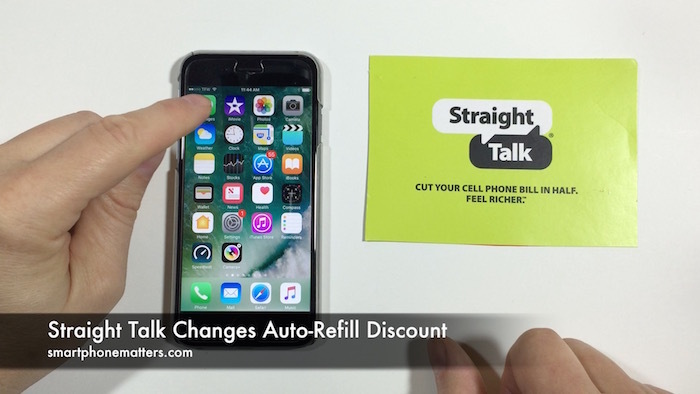 Straight Talk Wireless is changing their Auto-Refill Discount from $2.50 to $1.00 a month. If you are a Straight Talk Wireless customer receiving the $2.50 discount that won’t change you’ll continue getting that discount. New customers, however, will only get a $1.00 discount when they enroll in Auto-Refill. And, if you are currently receiving $2.50 discount but discontinue auto-refill and come back later, you’ll only get the $1.00 discount. Straight Talk recently sent me a text message telling me about this important change. The message included a link to page explaining the the change on straighttalk.com. While I am unhappy to see that Straight Talk has lowered the discount for new customer, I am glad to see that are recognizing their current customers and keeping the $2.50 discount. In my video I also take a look at section from my Straight Talk bill. You’ll see my subtotal is $42.50 and I have a $2.50 discount. The remainder of the bill shows state sales tax, and three other fees. I found this a little confusing because I’d think the subtotal has the $2.50 discount already added in. I’d think the subtotal would be $45 and the bill would show -$2.50 discount. One thing I wanted to point out is that when you pay your bill with a credit card, Straight Talk charges you three extra fees. For me, that is an $0.85 911 Service Charge, a $0.64 Federal Universal Service, and $0.09 Regulatory Cost Recovery totaling $1.58. If I bought $45 refill cards at Walmart I’d pay state sales tax but not those extra fees. With the extra fees my $2.50 discount is reduced to $0.92. So I auto-refill is still a little less expensive for me. If I were a new customer and only getting a $1 auto-refill discount I’d be paying slightly more by using auto-refill vs refill cards. It is still worth the convenience as I really don’t want to go to Walmart to buy cards. It’s not a lot of money but these fees do affect the total price you pay so I thought I’d point that out.